The holiday is nearly upon us, and all across the city, citizens are Christmas mad. The Pacific Electric Hollywood car stalled, halfway through the First Street tunnel, and when the wire fell down and sent sparks arcing across the darkened windows, scads of package-laden shoppers panicked and stampeded, despite attempts by train staff to calm them. Several passengers suffered bruised knees, ankles and backs. There’s naught but sadness at 4528 Amber Place, where the John Vernon Rosses mourn the death of their only child, John Vernon, Jr., aged 4. Mother was working days and father nights in downtown shops, to save enough to give the tyke his best Christmas ever, while a neighbor, Mrs. J.W. Loyal of 4600 Topaz Street watched the babe. When mother called for him around 1pm, he was dead in his cot, victim of some mysterious internal hemorrhage. An autopsy was ordered, but if any cause of death was found, it was never reported in the papers. And down on Wilton Place, the Parker Twins, Marion and Marjorie, whisper together about what to give their father Perry for his birthday tomorrow. They cannot know that tomorrow Marion will be kidnapped from her school by The Fox, and that despite the ransom Perry pays, she will never come home again. Following a frenzied search, three year old Betty Jane Wagner is finally back at home where she belongs. The little girl went missing during a downtown shopping trip with her mother, Mrs. Agnes Wagner. 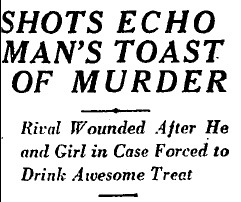 Covered in painful welts and bruises, the tiny victim recounted her ordeal to Detective Lieutenants Cawthorne, Harrah, and policewoman Vesta Dunn. “A naughty old woman took me and hurt me a lot”, she sobbed. She told police that she had been walking alongside her mother when she was suddenly grabbed by a strange woman who stuffed a handkerchief into her mouth, then carried her away. Unfortunately Betty Jane is much too young to give a detailed account of her kidnapping, but police are following up on a tip given to them by an elevator operator. The tipster works in a building downtown and told police that he’d taken a woman and child to the top floor. He was suspicious when the woman later exited the building without the tot. Police are seeking a woman whom they have described as a being a “mental case who derives pleasure from inflicting pain on others”. Her identity is unknown, so a warrant for assault has been issued in the name of “Jane Doe”. Betty Jane’s family is relieved that she has been returned to them, but they are bewildered by the brutal treatment that the toddler received at the hands of her abductor. The girl’s mother said that she could offer no reason for the pitiless attack upon her child. There was no follow-up to little Betty Jane’s story in the Los Angeles Times, so we’ll never know if Jane Doe was caught – and we’ll also never discover if she was a sad mental case, or a monster. There would be one account later in the year of a mystery woman’s failed attempt to lure a child into her car, but no arrest was made. 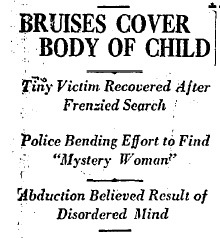 Jane Doe may have resurfaced in 1929 when several children in the Los Angeles area were abducted in department stores, taken to a restroom, and severely beaten by a woman who then released them. 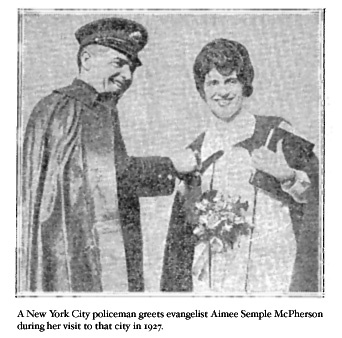 If it was the same woman who snatched Betty Jane Wagner and so cruelly battered her – where was she from 1927 to 1929? During the 1920s, one of the most common methods of treatment for mental disease was to dose the patient with barbiturates and other depressants to induce sleep. Was the mystery woman confined to an institution and subjected to “narcosis therapy” for two years? It’s conceivable that Miss Doe spent time in a dreary hospital room, sleeping fitfully on a narrow metal-framed bed, tortured by her drug induced nightmares. This is what we know: B.F. Boyd, of 1273 North Kingsley, is blind. He had a dog called Duke, and Duke’s been gone three months or more. Mr. Boyd believes his neighbor Mrs. Ada Blomquist snatched Duke, because when walking past her house he heard a whine he thought he recognized. Unable to locate the animal along the property line, Boyd returned with his son Paul and knocked on the door, whereupon the Blomquist’s Belgian police dog "Max" knocked him down. But was it from love or blood thirst? That’s for the court to decide, and by this afternoon, 18 people had taken the stand. Mr. Boyd seemed to sincerely believe Duke had been found, but two weeks later Mrs. Blomquist would be freed after testimony from a breeder that he’d sold her the dog when it was six months old. Boyd’s dog had been young, too, but that worked against him–the judge doubted he could possibly recognize his puppy’s bark when issued through an adult dog’s larynx. As for Mrs. Blomquist, she got her dog back, but it cost her dearly. We don’t know what they were feeding dogs in the city kennel in 1927 save that there must have been plenty of it. The bill was $40, payable before Max could be returned to his mistress. Or perhaps that was a last bit of Solomonic trickery from Judge McConnell. In any case, she wrote the check. Who Says Thereâ€™s Never a Cab Around When You Need One? Clifford J. Morgan needed some dough—hey, don’t we all—and what surer way to procure some than to stick up a gas station? So he hailed a dimbox and told the hack to take him off to the filling station at Jefferson and Figueroa. There the would-be highwayman told the taxi to sit tight, strolled into the oilpit, stuck a gun in the ribs of one C. F. Williams, relieved him of $45 ($537 USD2005), sauntered back to his waiting hansom, and motored away. Unfortunately for Williams, do-gooders Ralph Paine and W. Burke were in the station at the time, and, grabbing Officer Best along the way, found Williams’ taxicab quite conspicuous in its lines and coloring and was thus followed easily. At 51st and Central the trio caught up to and apprehended our hapless and callow highwayman. Vehicles-for-hire made the news again today in the strange case of five year-old Kenneth Stubbs, who had been placed by his mother Della in the home of Mrs. Bertha Whitiker at 3040 South Hoover. Mrs. Whitiker reported that a man called at the house, purporting to represent a local orphanage in which the boy’s mother wished to place him. After a brief conversation, the man departed. Two hours later, another man arrived in a taxicab. Mrs. Whitiker saw the little Stubbs boy invite the man into the apartment before witnessing said man scurry away with the boy in his arms, and the taxi speed away. (Estranged husband John Stubbs, up in Vancouver, is said not to know of Della’s whereabouts and therefore could not be part of this misuse of our public transport.) No further mention of the Stubbs kidnapping, or of little Kenneth Stubbs, is ever made in the Times. In the Times today, a round-up of street crime incidents calculated to terrorize city residents, or at least discourage freelance musicians, good Samaritans and lingering outside a lady’s home in an open car–sheesh, buddy, get a room. Clarinetist Antonio Cili thought he was being hired to play a gig when three gentlemen picked him up at Sixth and Broadway, drove to Fourth and Pecan, tossed him from the car, beat him silly and stole his instrument and $20. Jennie Emerson of 2611 Vallejo Street was nearly run down in the street while crossing at Daly and Manitou in Lincoln Heights, and while recovering her wits confronted by the armed driver and his pal, who threatened to kill her before stealing her purse. A bandit robbed J. Maganuma of $40 cash and a serving of chop suey at his restaurant at 4911 South Broadway. It was not reported if Mr. Maganuma spat in the food, but we certainly hope so. A. Eisner was carjacked at First and New Hampshire, forced to drive to Sixth and Lucas and relieved of his $100 stick pin, $40 watch and $8 cash. Maybe it’s Eisner’s home address of 5579 Santa Monica Boulevard or the fancy stick pin that gives this brief tale the whiff of rough trade, or possibly we just have dirty minds. Joseph Michael, while strolling by a doorway near First and Main was lassoed by a couple of rope-wielding miscreants who strangled Michael into unconsciousness and stole $35, this just two blocks from Central Police HQ. Kindly Arthur Roper was driving along (now defunct) California Street near Figueroa when he spied a fashionably garbed young lady in apparent distress in the middle of the road. He stopped to lend aid and her friend hopped onto Roper’s running board with a revolver, which was clapped to Roper’s chest while the gal riffled his pockets of $53 cash. And then there was Jacob L. Johannes of 228 South Rodeo Drive, who was sitting in a car with Miss Marie Boucher outside her home at 5806 Carlton Way when a fiend with a revolver relieved the lady of a $1000 fur coat, $75 watch and $50 bar pin. Johannes lost $6 cash. Buddy, you can’t afford a room… or Miss Boucher. Now be careful out there!